A record field of 341 runners took part in Sunday’s South Shields Harriers-organised Sand Dancer Multi Terrain 10k event, including a group from Morpeth Harriers, writes George Patterson. They were led home by Morpeth Harrier Ian Harding, who broke all of the previous winning records on the South Tyneside coastal course when he crossed the finish line in an excellent 31m48s, considering the cold and windy prevailing conditions. He finished a good 22 seconds clear of Jarrow and Hebburn’s Andy Burn, with Sunderland Harriers Over 35 Veteran Kevin Jeffress a further 35 seconds adrift in third place. Another prominent Morpeth Harrier finisher was Robert Balmbra, who finished sixth in 34m05s. Further down the field in 134th place was Morpeth Harriers’ evergreen Over 60 Veteran Archie Jenkins, who clocked 46m36s and was fourth in his category. However, he took the bronze medal in the incorporated North East Masters Athletics Association Championship. Cold and damp conditions were experienced by the five athletes from Morpeth Harriers, who respectively got their track season underway at the annual Anne Marie Readshaw Open Meeting, held at the Shildon Athletics facility, on Sunday. In the U17 Men’s 3000m, Scott Beattie who had a very fruitful winter on the cross-country circuit, finished second in his very first run over the distance. Beattie clocked 9m02.2s, only a mere four seconds adrift of Nathan Baker of Middlesbrough Mandale, the athlete whom he had also lost out to in the North Eastern Championships, however, had beaten him in the Inter Counties. The promising Morpeth star possibly paid a slight price for his early enthusiasm, however, under the circumstances, could feel pleased with his finishing time. Another Morpeth Harrier running the seven and a half lap event for the first time was Kieran Hedley, who can also feel pleased with his finishing of fourth in 9m14.7s, and just a few paces adrift of third-placed Max Pearson of Tynedale, another top regional performer. Joining Hedley at Shildon was his younger sister Rhiannon, who was an excellent sixth fastest of 22 runners who took part in the U13 Girls’ 800m. Rhiannon was running the two lap event for the very first time, and her time of 2m44.6s was an excellent performance, in that she was only a mere five seconds adrift of the fastest runner Emma Johnson of Edinburgh AC, and she is running a year younger than most of her opponents. In the U15 Boys’ 800m, Morpeth Harrier Ross Charlton was only a fraction adrift of his pb, when he finished fourth in 2m34.9s, and appears to be looking well tuned up with the new season fast approaching. Finally, Adam Weightman, who is now competing in the U20/Senior Men’s events finished seventh out of 13 in the Senior 3000m. He clocked a time of 9m48.7s. This Sunday, Morpeth Harriers begin their 2015 track and field season in earnest, when they host their first round North East Youth Development League Division One fixture at the KEVI track facility in Morpeth. Field action gets under way at 11.30am, with the track action beginning shortly afterwards at 11.45am. The club’s young athletes compete in a full programme of events for U13, U15 and U17 age groups, in both male and female genders, and are hoping that they can regain the Division One title that they first won two years ago, in the year of formation for the current structure. 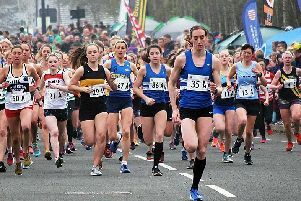 Last year the club finished second to Blaydon Harriers, who once again are among their opposition, along with newly-promoted Gateshead Harriers and Harrogate, and New Marske and Tynedale. There are four matches in the series, with the others being held at Gateshead later in May, Middlesbrough in June, and again at Middlesbrough in July. After a great deal of hard work by the various coaches at Morpeth, the club’s young athletes hope to impress, not only on the track, but also in the field events, where during the winter months, a great deal of dedicated development work has taken place. A good result is expected.